The proprietor of the local bagel shop is a wise communicator. I admire and learn from his soft-style marketing and sales techniques. They can be adopted/integrated as part of a core Social Communications strategy. There is typically a long line from the front door to the back of the store. The counter to order your bagel and other items is at the back. Customers walk past all of the offerings before they reach the counter (sort of like exiting through the gift shop at amusement parks). All throughout this process the proprietor engages with the customers. Sometimes it’s a simple, “We’ll be right with you folks!” other times it’s, “Don’t forget dessert, your family wants dessert!” My favorite part of this routine is the in-the-moment (real time) marketing “experiments” posted on the cases. 1. 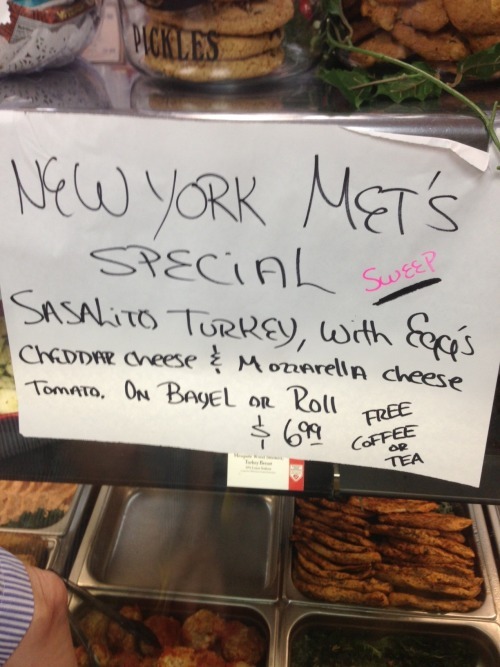 New York Met’s Special “Sweep” sandwich. The Mets had just swept the Yankees in four games; kind of unheard of in these parts. For Mets fans this is sweet revenge as the Yankees typically gain the lions share of praise in the NYC area. The proprietor chose to create a real-time product, using ingredients he already has on hand, that fits within his menu. 2. The Coney Island Stuffed Knish. 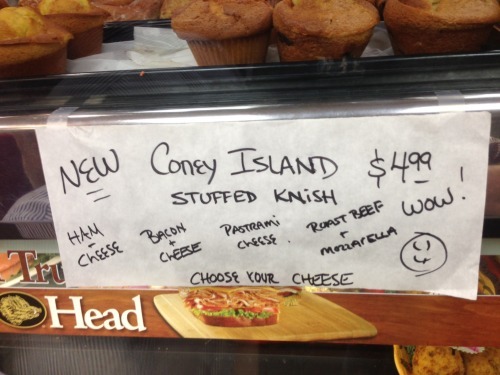 Branding a knish as “Coney Island” is a whole other discussion (see Mrs. Stahls), but the proactive ingenuity of combining two current offerings into one to test its reception is something that we can all do on a regular basis. Plus it adds some unique flavor to our communications plans. Call it a mash-up. A mash-up message. Display your advocacy (don’t hard-sell your services): The proprietor doesn’t broadcast the types of bagel and prices to his customers. He assures his customers that he cares about them. Be in the moment: Discuss current events through the lens of your comms plans and brand narratives. Mash-it-up: Refresh older items by reframing them through a mash-up into something new.